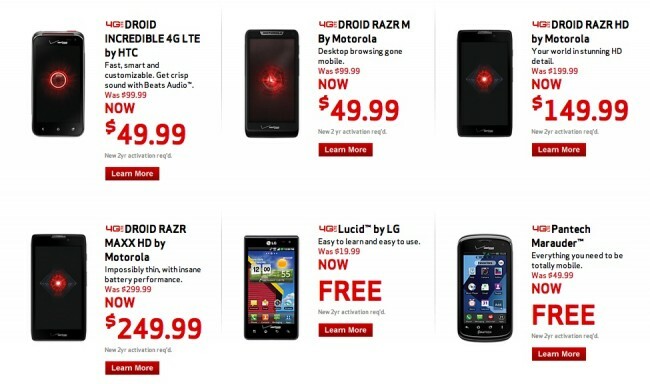 Verizon launched a new holiday promotion this morning, one that includes $50 discounts on two of their more popular phones, the RAZR HD and RAZR MAXX HD. Normally priced at $199 and $299 on contract, the RAZR HD can be had for $149 with the RAZR MAXX HD dropping in at $249 (on new 2-year contract). If you haven’t already, be sure to check out our review of these phones. We’re also seeing discounts to the Incredible 4G LTE ($49) and DROID RAZR M ($49).